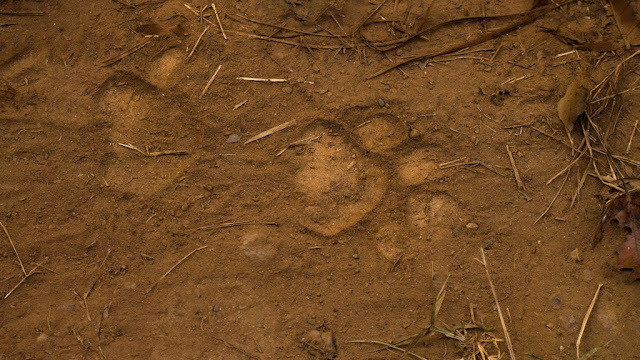 A lot of wanderings around India, A little around the world: When the Tiger Stood Me Up! When the Tiger Stood Me Up! A version of this story has been published in May 2015, in the Sunday edition of Deccan Herald. Eager-for-tiger me: Go to Bandhavgarh. See a tiger. Go, go, go! Eager-for-forest me: But Kanha is so pretty. Eager-for-tiger me: Maybe tiger cubs too. Maybe they’re all playing. How cute will that be? Eager-for-forest me: (In a whiney tone) But Kanha is sooooo pretty. Eager-for-tiger me: Tiger! Tiger! Tiger! 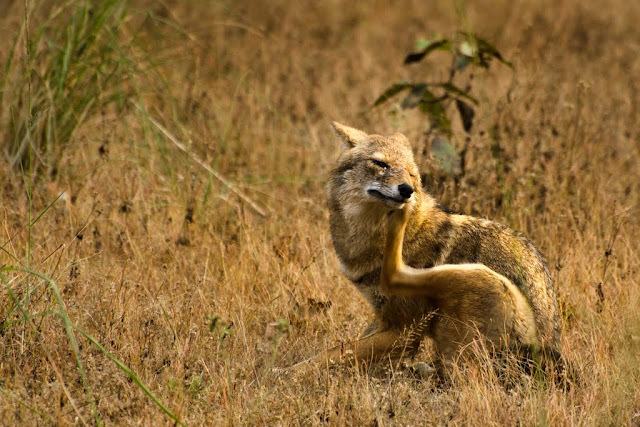 Go to Bandhavgarh!! Eager-for-tiger me: (shocked) You want to see a deer? (louder) A deer? (resigned) Bah! Don’t listen to me. You’ll regret this later. 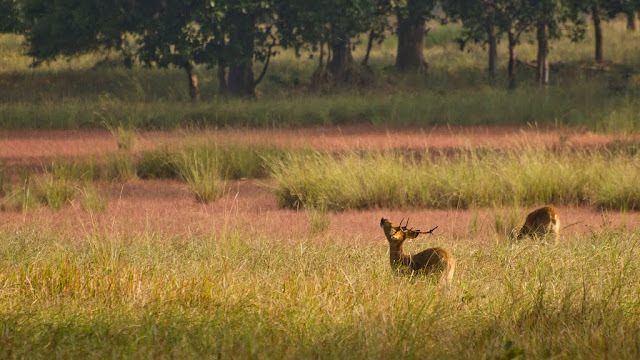 The romantic in me chose Kanha. But, secretly, deep down, I was also hoping to spot the tiger and laugh in eager-for-tiger me’s face. Kanha, in winter, has weather that makes you shiver despite your woolens and long for the comfort of a roaring bonfire or multiple shawls around you. 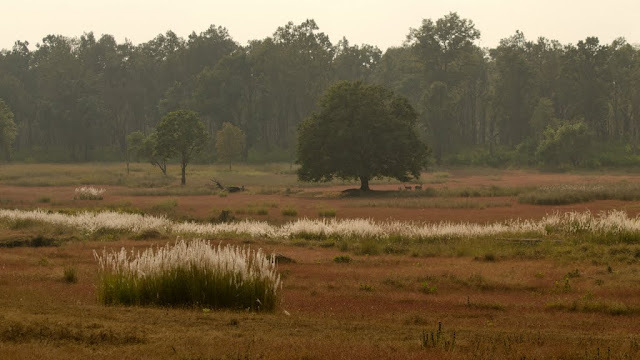 Driving through the beautiful Sal forest interspersed with rolling meadows, pinkish grass, white sheaves, glistening water-bodies and a low-hanging mist, I half expected movie stars to appear through the mist and run around trees, a la Bollywood. Besides Sal trees, they could also choose to run around the ubiquitous Indian ghost tree, Kullu, a tree that turns ghostly white in summer. Kanha’s stars, albeit the four-legged and the winged kind, were each endearing in their own way – Sambar deer strolling with their young, gaur grazing in the misty meadows, herds of Barasingha sunning themselves, and langurs indulging in funny antics. 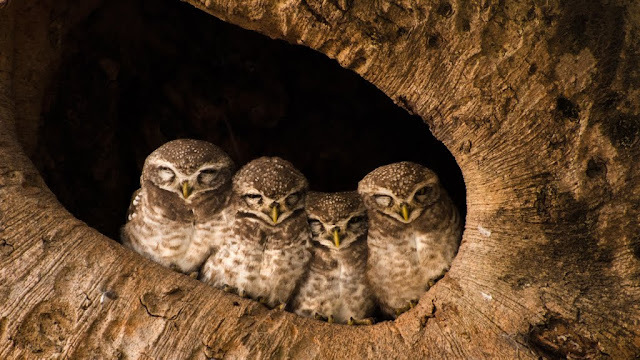 The cuteness competition was won hands-down by the Spotted Owlets living in a hollow near the park gate, their celebrity status mandating photo-stops by all visitors, each time they entered and exited the park. The first day’s safaris, in the Kisli zone, were uneventful. 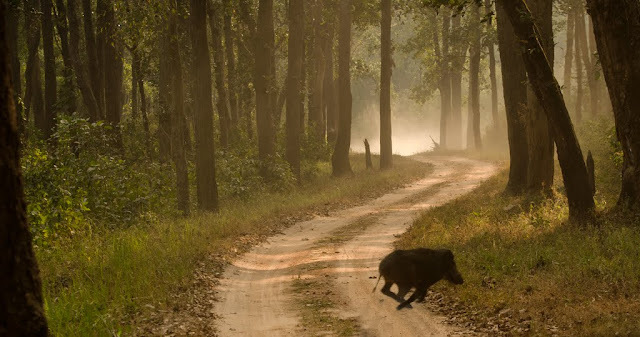 The next morning, we set off in the wee hours as usual, but this time, to the Kanha zone. Our driver and guide for the day seemed to share great camaraderie - very important for good teamwork that is required to track a tiger; our prospects looked bright. They animatedly discussed possible routes and tiger movements - a sign of knowledge; prospects were now brighter. To add to the increasing brightness, they spotted pugmarks, as fresh as they come. We followed the pugmarks for a while, until they disappeared into a bush. After discussions on what path the tiger could have chosen, we drove towards that area. Sure enough, the pugmarks re-appeared on the road. The air was electric with excitement as we sped along, as fast as the forest’s speed limit would permit. The guide stood on his seat, trying to spot the beast. It seemed like this would be *the* day. And, it was. My friend seated behind me hoarsely whispered “tiger! tiger!”. A handsome, juvenile male walked on the road ahead, his coat’s flaming yellowness intensified by the golden morning light. 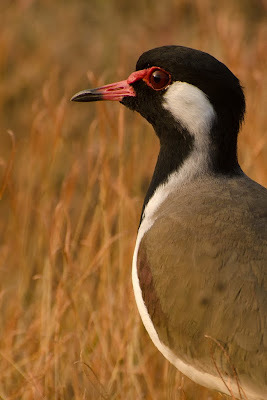 As he heard the rumble of our engine, he turned to look at us and darted into a nearby shrub, only to be seen no more. If this were a sitcom, the background track would be playing a sympathetic “aww” just about now. Why? Because I hadn’t seen the tiger! Seated right behind the standing guide, all I had ended up seeing was the guide’s back. All my friends had seen the tiger and were aglow with excitement. We congratulated the driver and the guide for their brilliant tracking. They were as excited as the others, to have seen the tiger. I was a little glum. Our friends in another jeep too had enjoyed a long sighting of ‘Langda Munna’, a special tiger - the stripes on his forehead actually spell out the word ‘Cat’. As we disbelievingly crowded around our friends that afternoon, looking at photos of Munna, I crossed my fingers in hope. That evening, almost at the end of our safari, we saw jeeps lined-up along an embankment in an area called Badrinath; we too pulled over. In hushed tones, another guide informed us that a tigress had climbed down the embankment, and would most likely walk in the valley below. Soon, excited whispers told us that the tigress had been sighted. Everybody in my jeep could see her but I still couldn’t! My friend Anjali then moved away and nudged me to her side of the jeep so that I could take a look. There the tigress was - a lithe silhouette in the dark evening. Then, faster than you could say ‘tiger’, she was gone. All that remained was the memory of her regal gait. The next day, on my last safari before I returned home, we unsuccessfully tried spotting the tigress in the same area she was seen last evening. With just thirty minutes to go for the park gates to shut, we headed back. En route, another jeep drove past and told us that they’d just sighted a Sloth bear, 300 metres ahead, and it had disappeared into some shrubbery. Arriving there, we could hear the bear and see it hidden behind a bush, excavating a termite mound for food. Our guide had the foresight to wait, and correctly predicted that it might cross the road over to the other side, once it was done with the mound. So it did. 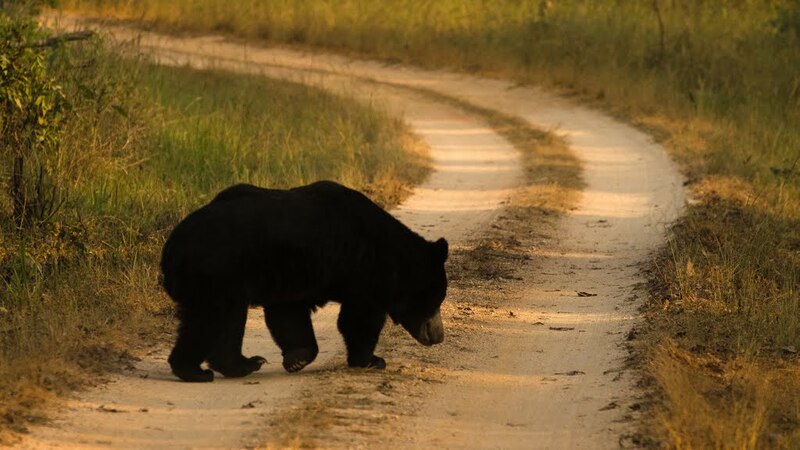 As the bear emerged from the bush, walking very close to our jeep, there was frenzied photo-taking, despite our hands shivering with excitement. Without even glancing at us, it disappeared once more, into the shrubbery. 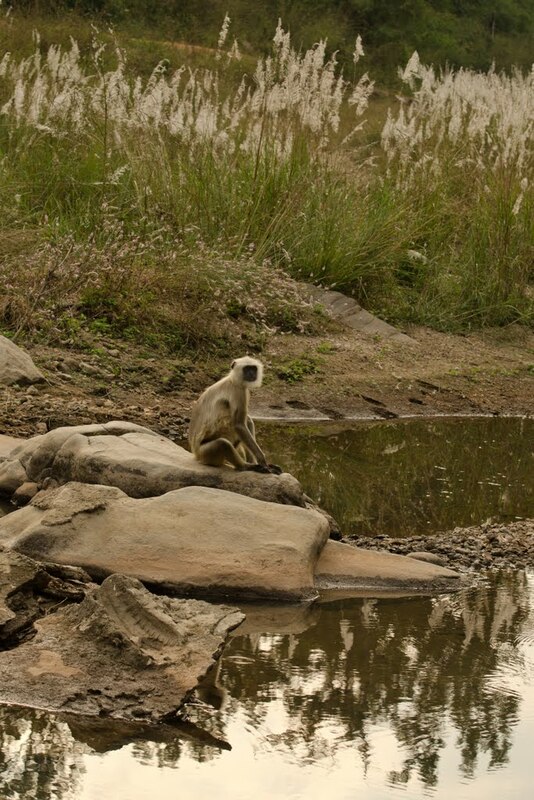 I left Kanha the next day, wondering if I should have gone to Bandhavgarh. Eager-for-tiger me was probably rolling with laughter, a smug “I told you!” look on the face. 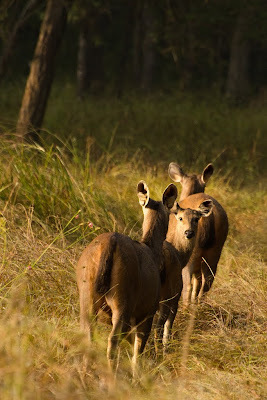 But, on hindsight, I had enjoyed being in the forest; Kanha is a pretty maiden. All the animals looked gorgeous with their lustrous winter coats. Sightings of the Barasingha, the Spotted Owlets, jackals and a Sloth Bear made my trip, as did seeing and following fresh pug-marks every day. And, to be fair, I did have a fleeting glimpse of the big cat; at least the jinx was now broken. The tiger, though, still owes me an unhurried date. as part of a tour by Toehold; led by Sachin, Phillip and Santosh. Getting there: Jabalpur (approx. 2.5 hrs away) is the nearest airport. Nagpur (approx. 4.5 hrs away) & Raipur (approx. 4 hrs away) are other options for airports. Drive from either of these cities to Kanha. Accommodation: We stayed near the Kisli gate, at Bundela Safari Lodge. i was ur travel buddy and u with ur wonderful narrative style , recreated all the little moments of kanha ..sans the tiger.. I enjoyed reading this, Raji! And i know just how you feel. Enjoy your trips and see you soon. Hey Smita, I enjoyed reading this. The narrative had a personal tone that I really liked. The kid read some too, she got lost at the Bollywood actors part, so that spawned a new discussion! Could we please get a 5x7 print of the owl family? it's really cute and adorable!